Be Optimistic, that is what I have learned today. 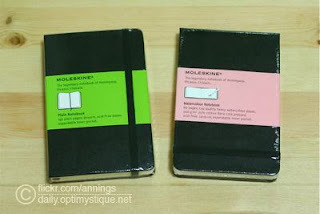 While I was surfing the net, i stumbled upon this site called Daily Optimystique and yes, she is giving away Moleskines Diary. The truth, you know me, I am a contest junkie but when I see a great site, I savor the goodness of it and browse through different posts of the author and will immediately get its link for me to place it on my sidebar, so I can visit it again. Anna, the author behind the Daily Optimystique is a young, talented and optimistic woman and would you believe, she's already blogging for almost seven years, Isn't that great? I really love her template. It's very neat, organize and ooh so dainty. And ooh, for her first blogging give away, she is offering these beautiful Moleskines Diary. "There will be TWO WINNERS. The first will receive the Plain Notebook, while the second the Watercolour Notebook. Post a comment in this blog with your name, email, country of residence, and state why you want a Moleskine and what you’re planning to do with it if you win. Plus, paste the links to your blog/tweet about this giveaway too." Visit her site now to learn more and most of all Remember this two words always. "Be Optimistic" , life maybe hard but having a positive mind can help you make it worthwhile.